We didn't intend to go skiing. But once we got to the barn and gathered our gear for an upcoming ski trip, we couldn't help ourselves. The sun was setting, the amber light splashed across the hills, and the snow called us out into her fleeting magic. 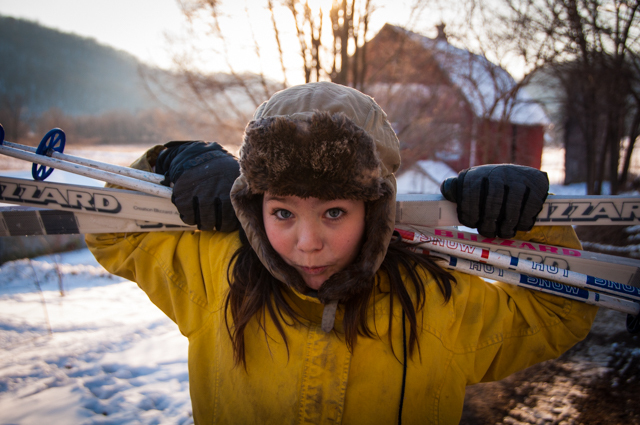 Before Pete came home from work we set off toward the creek, the kids on their skis for the first time all winter. Spontaneously, joyfully, like one giant shared exhale. Each year we cobble our gear together from skis and boots and poles we find at thrift stores and rummage sales. Then the shell game begins, as we match up bindings with boots, screwdriver in hand, moving bindings from last year's skis or the year before to the new, bigger set, and hoping we don't break anything along the way. Tight budget, meet our love for skiing. It's a little cobbledy, but we make it work. And so finally (though it's already February) the boots-and-bindings game was won, and we headed out into the golden light. We quickly found our groove, taking turns cutting the trail toward the woods. 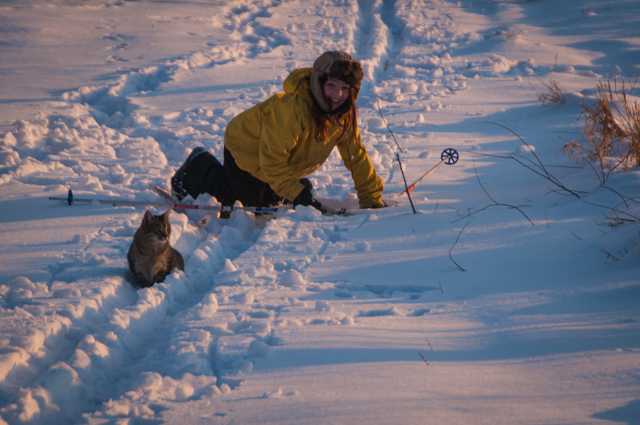 We stopped mid-stride to listen to the barred owls in the hills, and shared a few laughs as the following barn cats set to work attacking our skis. Pete came home as Sage and I headed inside, and he set off on foot beside Lupine for one more loop around the pasture. My kids have sensitive hearts, as do I. We largely avoid the news, opting instead to spend our time here, listening to the crunch of snow beneath our feet and the owls chatting in the forest. Today, of course, after reading the reports from the past days, my heart aches looking at these photos. My kids. Our life. This safety and privilege and ease. Another school shooting; another troubled man-child with a gun in his hands. Like most of you, I don't know what to do with it all. I can't even begin to make it fit in these pictures of what I think childhood should be – simple, safe, and free from adult-sized worries and fear. I wrote the words below after hearing about the victims in Florida, and reflecting on story after story that we've heard for two decades; stories that are so much the same and so thick with incomprehensible grief. Today my kids, Pete, and I will tap our maple trees. We will stand out beneath these hills, the warm sun on our faces, and we'll savor the safety and magic and normalcy of our days. But my head and my heart will be with the children who are loading onto buses this morning, heading to school for another day, and with those who's days were stolen. As a child, my greatest fear was of a house fire. My dad modified my bedroom window with a fire escape; I modified my childhood. A braided necklace for my teddy bear, slipped over my wrist each night before sleep; a shoebox filled with treasures close at hand beneath my bed. Quiet rituals and prayers, whispered to myself before sleep. Today we have modified childhood so much that it is hard to recognize. Active shooter drills exist alongside fire drills in our schools. The new normal; the new real and terrifying threat that we face. That our children face. There is no box big enough to hold the fears that our children must carry. This is our country. What have we done? She does not need our prayers. She needs our action. We owe it to our country. And most of all, we owe it to our kids. In Britain we just cannot make sense of your country; you believe it is everyone’s right to be able to have access to automatic weapons, yet no ones right to free health care. I just don’t get it. Most of us cant make sense of it either, Debbie. Truly. Thank you for your words. My children are little and I try to hide the horrors of the world from them. Instead, we focus on the beauty. I feel like the beauty is their sheild for their hearts for the broken world we live in. My husband and I were asking ourselves last night…what does a parent do? How can we prevent or help or tak action. I love your call to action….but how? I mean that sincerely. Where do we start and how do we “arm” our children to thrive amidst the nature of the world today. The world is beautiful but it can be a scary place. I’m so angry for you all. I’m just so incredibly angry that once again an angry white male gets to do this. It will take the women of the USA to stand up and say NO to anymore male violence, to say we care more about our children than we do about our guns. Talk about phallic obsession. Time’s up for angry white men and oppression they have made us all live through. Enough.